If you’re going to lose your lead, at least do it in an amusing fashion. Despite the lack of drama left in the 24 Hours of Le Mans’ top LMP1 class, the LM GTE Pro class battle is as hotly contested as ever. No. 95 Aston Martin driver Richie Stanaway lost his lead, but gains my nomination for Almost-Save Of The Year. Stanaway’s No. 95 was leading the class until he was a bit too enthusiastic on his out-lap, locking up his wheels heading into the Mulsanne run-off area, running off nose-in to the barrier. 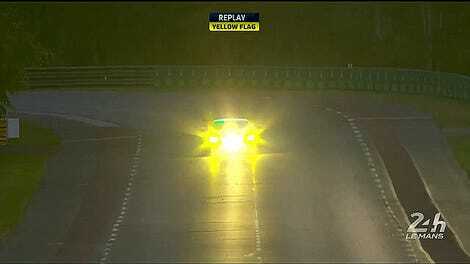 This almost immediately gave the LM GTE Pro lead up to the No. 63 Corvette currently being driven by Jordan Taylor. But then Stanaway saved it brilliantly—he immediately popped the car into first gear and drove right out of the gravel pit, not allowing the car to sink in and get stuck like most. Of course, the front end and inside wheel arches had to be repaired. The gravel was vacuumed out to make sure the belts wouldn’t get cut by any stones as well. Once again, teams connected to a rally team keep amusing the crap out of me at the 24 Hours of Le Mans. In this case, it’s the Aston Martin team that’s run by Prodrive—yes, that Prodrive from the Colin McRae era—proves that they have some mad off-road racing skills. Nicki Thiim has now returned the cleaned-up and reassembled No. 95 to the track, as Stanaway has probably been told to take a nap instead. The No. 95, sadly, slowed shortly after it returned to the track—perhaps they missed something in their quick repairs. 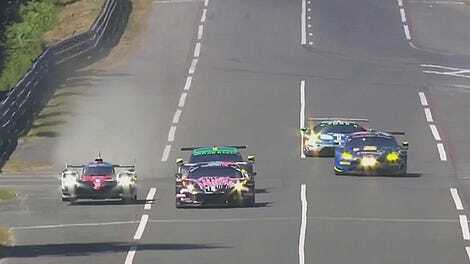 Of course, because GTE Pro is insane, the front of the class has already swapped positions several times, with the No. 97 Aston Martin now in front of the No. 63 Corvette. Any number of cars could still win that class, and it’s clearly the one to watch since the No. 1 Porsche is 12 laps ahead of everyone else for the overall lead. Just for fun, here’s a couple other moments of off-roading excellence from this race. Can Someone Run An Aston In The Baja 1000?